Kisses was seen roaming the neighborhood for about a week before my son's friend was able to catch her. She was practically skin and bones and very timid. My son's tried to find the owners to no avail. He couldn't keep her and needed to find a home for ASAP. When we were asked to take I took one look at this skinny, scruffy, wired haired dog and said "Hell No!". We did agree to keep for a few days in hopes a permanent home could be found. She was so afraid of people it took us three days before I finally caught her while she napped. I held her in my arms for two hours while petting her and soothing her with a soft voice. When our four day commitment to keep her drew to an end we were told she was going to another temporary home for a few days and then to the pound if a home could not be found. It broke my heart at the thought of her having to adjust to another temporary home and possibly the pound so my husband and I had a long chat as to whether or not we should keep her. After deciding "yes" we had to come up with a name. I was holding her while we were throwing out names back and forth when she attempted to "kiss" me. Kisses! That is her name. Although we have been told by several people she is a JRT we are not 100% positive. 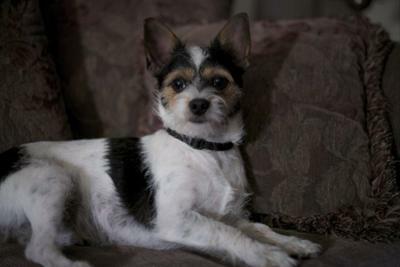 She has all the markings and most of the personality traits, although she is more mellow than the average JRT. This picture was taken about six months after she adopted us. She was just bathed and groomed and as you can see, she is at a healthy weight. Since our only son has moved away to attend college she has filled the void so we do not suffer from the "empty nest syndrome". She is a great source of entertainment and so very smart. She quickly learns commands and is very obedient unless she sees a squirrel or bird, then its on! Our sweet little Kisses brings us lots of joy. Awe Thanks Sue. We will pass on your kisses to Kisses. We are sooooo happy that we made the decision to keep her. As my husband I and were discussing the option and agreed we should keep her she jumped off my lap and ran through the house like only a JRT could. She knew she had a home! From the streets to a throne! She looks like she's queen of the castle now!